The first time we reviewed Canopy Growth Corporation (WEED.TO) was at the end of April this year. The stock was about to complete a triangle pattern which successfully revolved to an exceptional breakout. See here. That was the first great time to acquire some shares. We believe that now it is a second favorable opportunity to go long again. The cannabis industry is very likely going to be a top performing industry on the financial market in a year of 2018! Those who watch a marijuana sector have been seeing the wild rides among many stocks this year. Some stocks do better than the others and some will just not make it with positive figures. Therefore, it is important to invest in a good quality selection of pot stocks! As already mentioned this stock developed a Symmetrical Triangle Pattern in the first half of the year (blue wide lines), which resulted in a wave of rising price doubling the market cap of Canopy Growth when a huge breakout of entire industry happened in August. The price got pretty high with many weed stocks and no wonder it needed a consolidation. 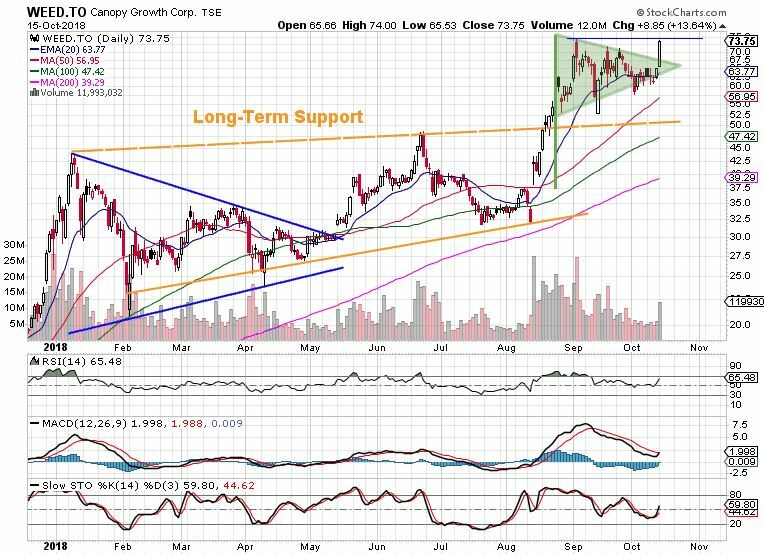 Canopy Growth stock has consolidated while sliding the 20 EMA. Finally, it has formed a well-known Flag & Pennant Pattern, which is now waiting for its completion. A risky trader might consider this breakout from the pennant zone as a good opportunity. A cautious trader is going to wait until the price pierces above a thin blue line, that represents a top of the flagpole. The technical indicators are supporting a potential breakout very well – RSI has not left the above “50” territory for some time. MACD is sloping nicely up across the signal line and the stochastics are significantly confirming the uptrend. The volume at yesterday’s price rise was significantly increased confirming strong interest by the investors. Today might be a day of another price rise with the desired BREAK-OUT! Interesting times are happening. Legalization in Canada is knocking on the door – tomorrow is a historic day for the marijuana industry. Not only the first nation of G7 is opening gates for legal recreational cannabis, the whole world is getting more and more aware of the truth about a plant which was forbidden for almost a century! Canopy Growth Corporation is one of the TOP cannabis companies whose stocks should be part of every successful pot investor portfolio! If you wish to stay informed about great investing ideas, simply subscribe to our future posts entering your e-mail in a right side bar.